Later this week, I’ll be in Richmond, Virginia, to participate in The Writing Show, a monthly program put on by James River Writers. I’m looking forward to returning to the city, which was the site of one of my first book festivals, and I’m especially eager to be taking part in a conversation about authors and online media with Rebecca Joines Schinsky of The Book Lady’s Blog and Joe Wallace, the author of Diamond Ruby, with Kelly Justice of Richmond’s Fountain Bookstore serving as a moderating influence over the three of us. If you’re in the Richmond area on Thursday, August 26, you’re welcome to join us at the Pavilion Room of the Children’s Museum (2626 West Broad Street) from 6:30 to 8:30 p.m.; advance tickets are $10 but will go up to $12 at the door. Otherwise, I think there’s a good chance this particular Writing Show might be podcast, and if it is I’ll be sure to tell you about it. 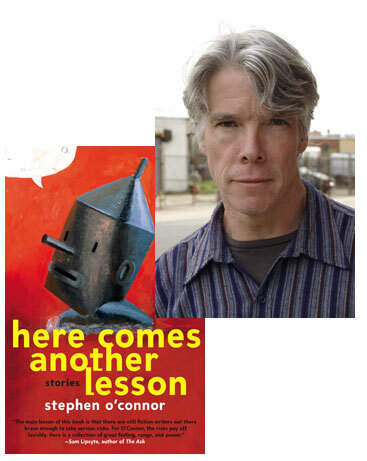 One of the things I love about the stories in Stephen O’Connor’s new collection, Here Comes Another Lesson, is the way the scenes play out in staccato bursts—check out “Ziggurat,” in which a Minotaur wandering through a postmodern Labyrinth happens upon a teenage girl who isn’t nearly as terrified of him as perhaps she ought to be, and you’ll see what I mean. (The story right after it in the collection, “White Fire,” deploys much the same tactic in a more psychologically realistic fashion, as a soldier coming home from Iraq struggles to get his life back the way it was; it’s so effective that you might miss the sheer brutality of his failure the first time you read through, only to have it hit you at the story’s end. And then there’s the sequence of stories sprinkled throughout the book featuring Charles, “the professor of atheism,” who fumbles through a variety of scenarios that sorely test his lack of belief in the divine. Whether he’s writing in a surrealist or a realist mode, there’s a dream-like quality to O’Connor’s prose that will remind many readers of Kafka—no accident, as O’Connor reveals in this essay about the inspiration he found in a particulary vivid Kafka short story. The first time I read Franz Kafka’s “A Country Doctor”—at around age twelve—I had the distinct impression that I was discovering myself, that in his language and images, and in particular in his always surprising juxtapositions and narrative turns, I was experiencing something essential about the way I was and wanted to be in this world. By the time I reached the end of this sentence, I already had a sense of the terrific understatement that its first six words would soon turn out to be. I could feel the narrator’s barely suppressed hysteria through his repetitions (“a gig, a light gig;” “no horse to be had, no horse”), through the intensity of his adjectives and adverbs (“great,” “urgent,” “seriously”), and in the way six short sentences had been jumbled into one outburst. What is more, I had a sense that neither the narrator nor the world in which he existed was quite normal. Why had he bothered, for example, to emphasize what we would have expected: that his gig was suitable for the local terrain? And why was he waiting in his frigid courtyard when, not merely was his gig still unhitched, there was no horse for it? And then there was the simple oddness of a doctor, a man of science, alone, “muffled in furs,” passively waiting for fate to change, and the peculiar implication that, since the blizzard only “filled all the wide spaces between” one place and another, it had somehow stayed outside the boundaries of each. This was a world in which things could go very wrong (people became seriously ill, horses vanished) and in which one was deprived even of the consoling expectation that people and things would behave in a normal, predicable and rational way—a world in which one could accept that the doctor’s “perplexity” was “great” indeed, and expect that it would only become greater.